I’m not generally a fan of sprawling cities with lots of traffic and diesel-spewing cars. La Paz, however, with it’s mesmerizing mountainside construction and flourishing vegan scene, quickly won me over. 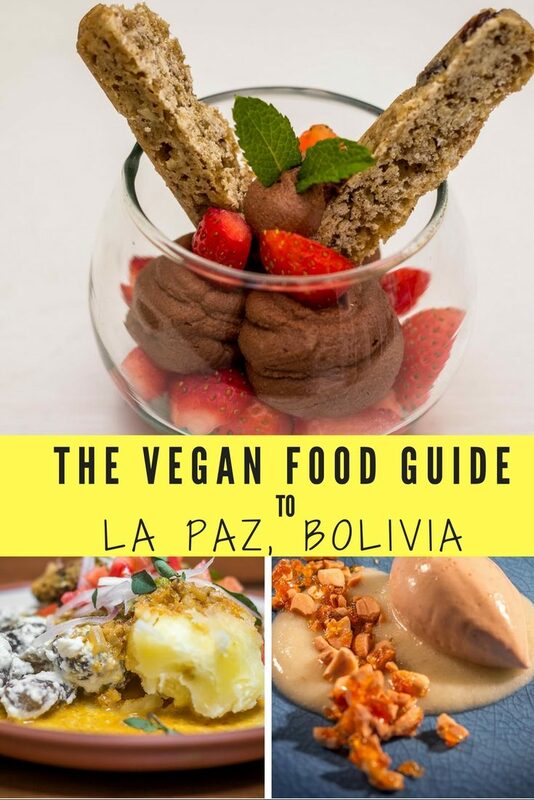 I had heard that La Paz offered several vegan restaurant options, but I never expected to discover one of the most vegan-friendly cities of our travels offering some of the best food we’ve eaten to date. Situated in a valley between the Andes and the Altiplano and next to Lake Titicaca and the Yungas rainforest, La Paz provides an incredible and abundance of year-round, local produce. Markets line the streets daily with colorful displays of every type of fruit you could want – from apples and pears to mangoes and passionfruit, plus fruits I’ve never before seen, Bolivia has it all. And, if the plant is native to Bolivia, it’s grown without GMOs as dictated by the Law of Mother Earth enacted in 2012. The tight knit community of vegan restaurants located in strategic locations so as to cater more to the Paceños (La Paz residents) more so than the tourists works together to cultivate a culinary celebration in plant-based foods. Even in a meat-heavy country, Bolivians are beginning to recognize the benefits of healthier eating and flocking to La Paz’s dozens of vegan-friendly locales. With the high number of options, we of course, weren’t able to visit them all, or even most restaurants. We did our best to hit as many as possible and offer you our thoughts and experiences below. Smack dab in the center of Old Town lies Ali Pacha, a peaceful oasis amidst the blaring horns, crowded streets, and chaos that consumes La Paz. The chef behind this classy restaurant, Sebastian Quiroga, aims to use the restaurant as platform to educate guests about social and environmental responsibility in terms of our food and to revitalize the neighborhood. 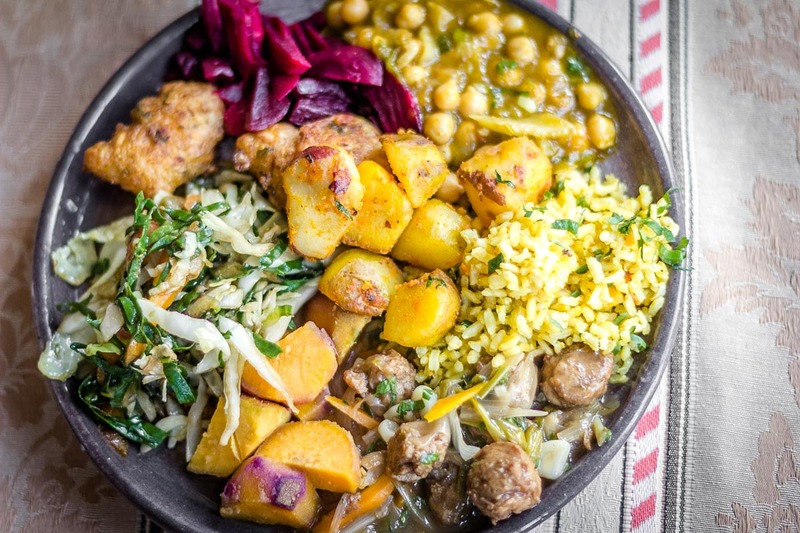 The idea is to cater to Bolivians working nearby and offer them the opportunity to come in and try a plant-based meal without forcefully imposing a different way of eating. Most of the furniture is repurposed or locally-made and each plate takes advantage of Bolivia’s incredibly variety of food. In native Aymara language, Ali Pacha means Universe of Plants. And universe, it was. The entire table must order the same number of courses (options range from three during lunch and five or seven for dinner). The meal itself is an interactive experience with Chef Sebastian bringing exotic fruits and vegetables to the table as your plates arrive, explaining and showing exactly what it is that you’re eating. 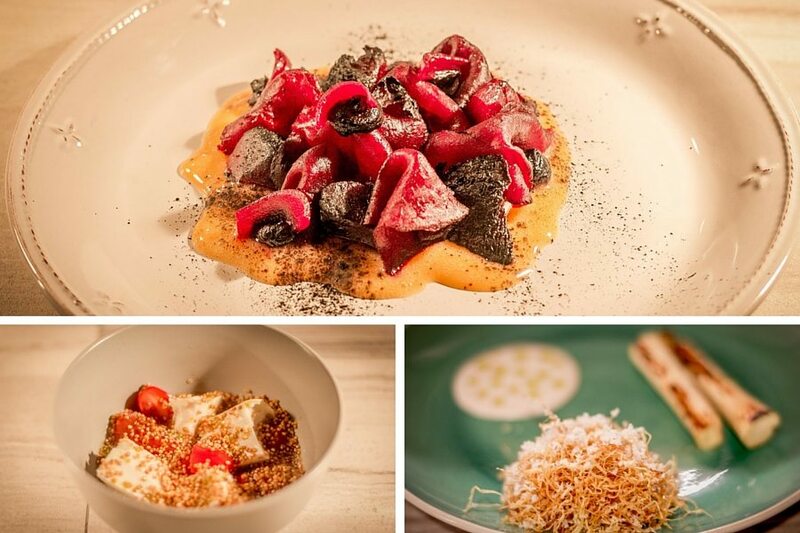 We delighted in each plate, the star being the beet dish, which featured charred beets, beet ash, shaved beets, everything beets. It was fabulous. Our first dish was a sort of crunchy quinoa soup with tomato water as the broth and quinoa cheese. As a dessert lover, I was more than pleased to received two dessert courses. Both ice cream, both incredible. Even coming from foodie Portland, Ali Pacha served one of the best meals I have ever had in my life. If the word vegan scares you, just visit Ali Pacha and you’ll think differently about plant-based eating. What started as a tea shop to counter the burgeoning coffee culture in La Paz, Namás Té (which is a play on words: Nada más que té or nothing more than tea), began offering food when they noticed slow growth. Chef Paul Jove’s sister, Elvia, a long time animal rights activist in La Paz insisted that any food must be vegetarian. He gladly obliged. A warm and welcoming place, Chef Paul and Elvia made us feel at home and even Sora was invited to join us inside while we dined. Diners may choose from the three-course menu of the day or items a la carte. 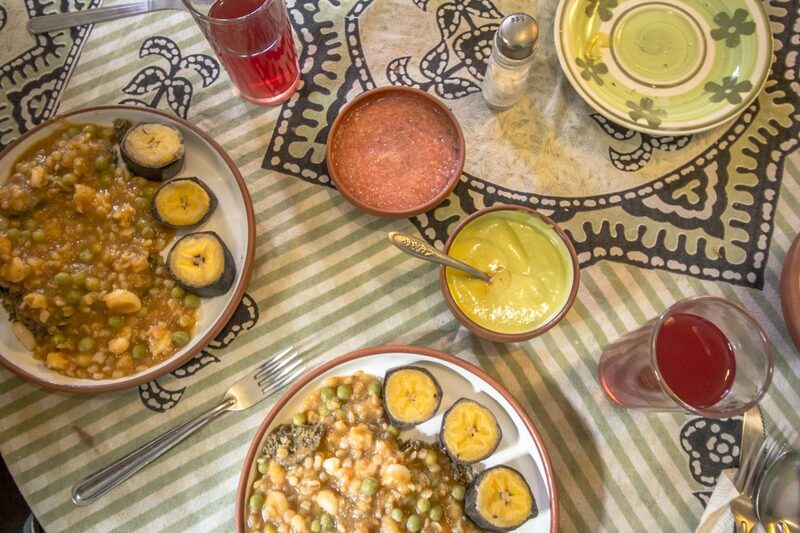 A mix of international cuisine and veganized Bolivian traditional meals, Namás Té offers a wide range of comfort foods for an incredible value. The intention behind the restaurant has always been to offer affordable, healthy food to everyone, not just tourists. During our visit, the menu of the day began with a barley salad, which we enjoyed with a green smoothie. The star of the meal was the main dish, a vegan take on the Bolivian dish Sajta. A pan-fried quinoa patty accompanied by a variety of potatoes, including chuño, Andean black potatoes. The meal finished with a darling cup of muesli. Namás Té ended up as one of our favorite dining spots during our three weeks in La Paz due to its affordability, great food, and wonderful staff. We went back for lunch twice after our initial visit and felt right at home. 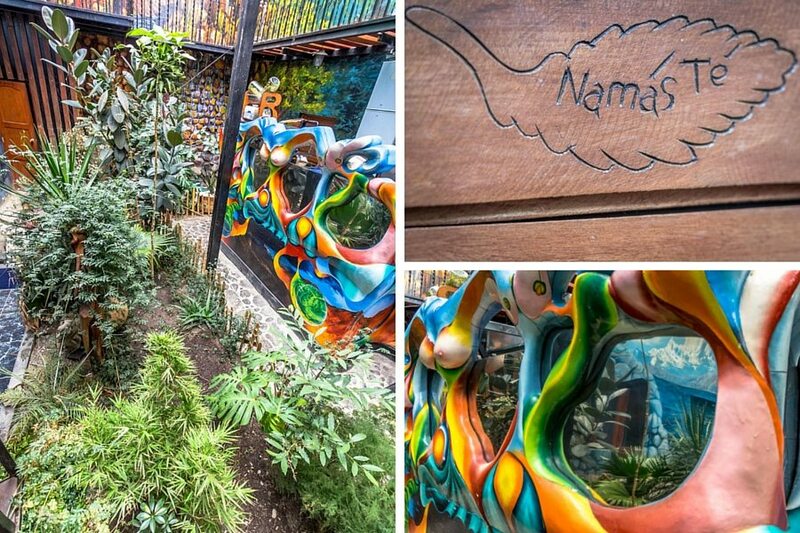 Tip: Head to the back of the restaurant and check out the colorful murals painted by Chef Paul’s brother and take a peek at the courtyard garden. 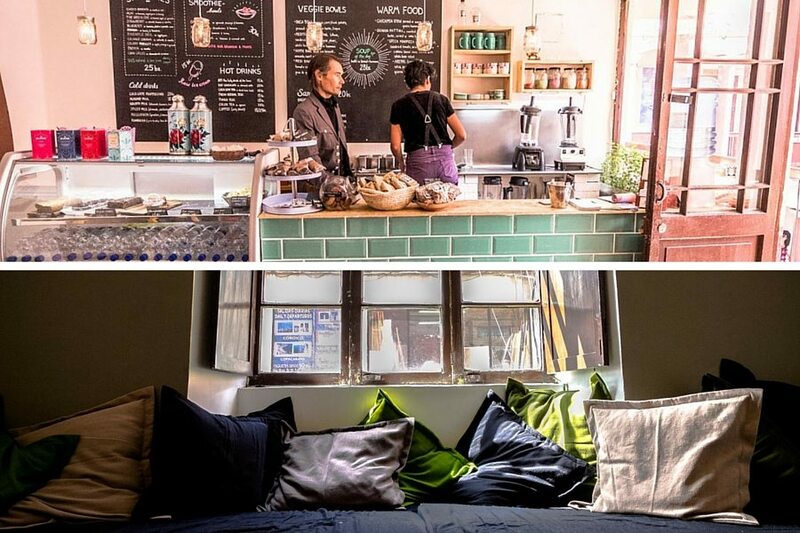 Nestled inside a courtyard off the bustling tourist street, Sagarnaga, Cafe Vida is a cozy spot to enjoy a fantastic vegan meal or get some work done. All menu items served are vegan, though may use honey, so inquire before ordering. 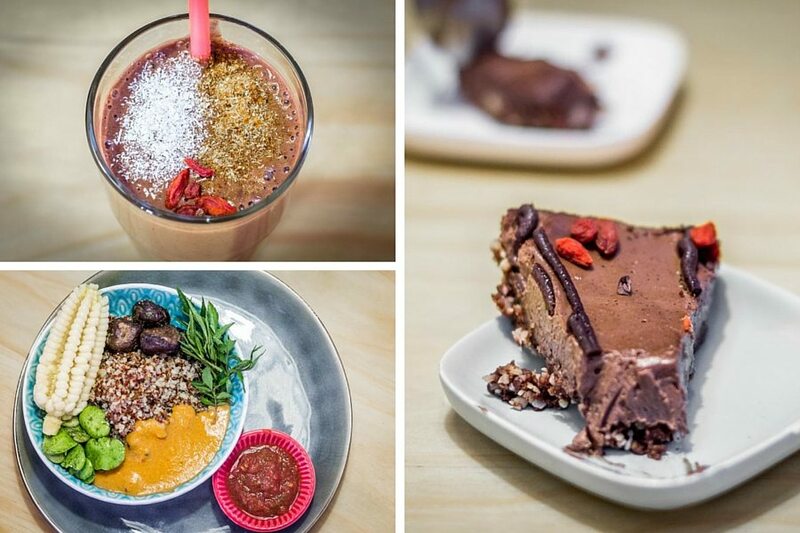 Cafe Vida offers smoothies, smoothie bowls, quinoa bowls, and sandwiches. We both went for the Inca bowl – quinoa topped with fava beans, black potatoes, corn, and peanut sauce. While waiting for our bowls to arrive, we saw the list of smoothies and immediately ordered two – the chai spice for me and the chocolate banana for Dave. Both were blended to creamy perfection and were so delicious that we scraped the sides of the glass with our straws to get every last drop. For dessert, we went with the mocha cake, a raw torte topped with goji berries and cacao nibs that satisfied my chocolate craving. Tip: Cafe Vida offers Hatha Yoga every Monday, Wednesday, and Friday from 12-1:30 for 35bs. Located near Plaza Avaroa in the Sopocachi neighborhood, MagicK serves pescatarian fare in a cozy lounge with a north-African-type feel. Dave and I both ordered salads, indicating we were vegan, yet Dave’s arrived topped with cheese and mine with some sort of white cream sauce. After inquiring about the cheese and sauce, we were informed that Dave’s was not available as a vegan option, yet we still had to pay for it, and the staff swore my citrus salad was vegan. Not entirely trusting the veganity of my salad, I consumed it regardless and it was quite refreshing. Accompanied by two friends, our main dishes all arrived at separate times and the size of the main platters were laughable. One friend ordered pizza fit for a child. Fortunately, he was the recipient of Dave’s vegan salad fail, otherwise he would have had to seek out an additional dish. Dave and I both ordered the Tom Yum Soup, which had great, spicy flavor, but was more appropriate for a side as opposed to a main dish. The menu featured a decent local beer selection and a live jazz band performed on the night of our visit. A lovely ambiance, with a romantic feel, it seems as though we may have visited MagicK on an off-day. 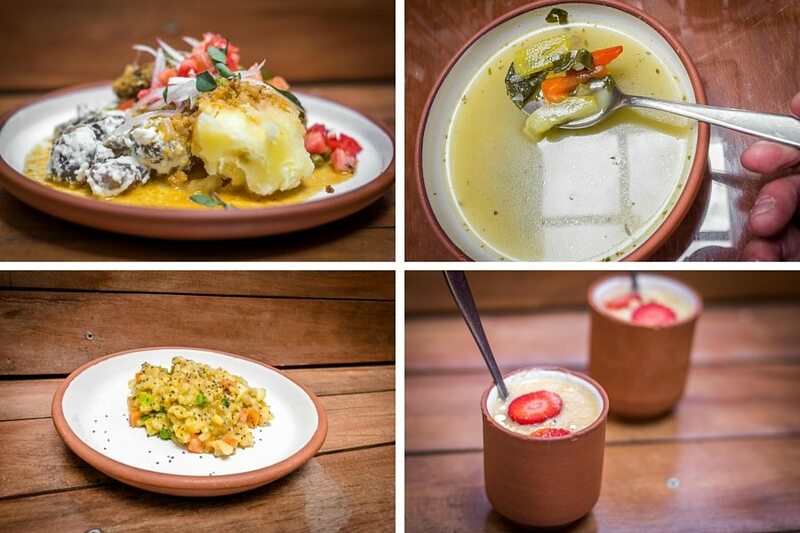 Operated by Hare Krishnas, Laskmi offers a daily set menu at an incredibly affordable price. For $2.50 per person, the meal come with two courses, plus bread and a spot-on aji sauce. On our visit, we learned the soup of the day contained butter. Upon learning we were vegan, they told us that had they known before our arrival, they would have prepared the soup without butter. Fortunately for Sora, this meant she got a homemade meal for dinner! The main course was a curried barley and pea one-pot dish. It was great comfort food and the fried plantains on the side had a nice caramelization. The chef informed us that if we returned the following week, that all the food would be vegan. They also sell freshly baked seeded bread and you can find the staff wandering around parks and busy plazas selling vegan breads or veggie burgers, practically for free. Beer lovers rejoice! Sol y Luna offers the largest variety of local and international beers that we found in the city. They have several local craft beers on tap each night and a bevy to select from in bottle, both local and import. 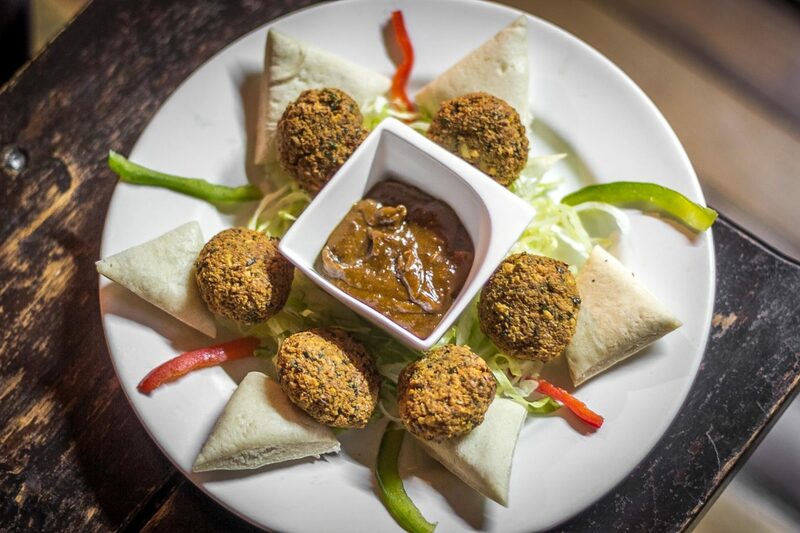 The menu offers a wide variety of international cuisine for both vegans and omnivores alike. There’s a pool table downstairs and live music on Thursdays and Sundays. Located on top of a bookstore with the same name, Café Armonía offers a vegetarian buffet with plenty of vegan options. On our visit, everything provided was vegan. All fruits and vegetables are grown on their offsite farm where they use zero fossil fuels for production. We enjoyed the vast offering of items available, though the food itself was a bit bland. For 34 bs per person, for an all-you-can-eat buffet, however lunch is a steal. I got a tip about El Ceibo Chocolate from Oh, Ladycakes. As vegan chocolate lovers traveling in a country that loves to ruin their chocolate with milk, I couldn’t buy enough El Ceibo Chocolate. A cooperative located in the Alto Beni region located at 400 masl and grown completely free of chemical additives, El Ceibo has been making organic chocolate since 1977. From farm to production, all aspects of this company are aimed at providing a benefit to it’s cooperative members and sustainable production of its product. Found all over La Paz, look for El Ceibo in the bio stores or look for signs promoting them in small shops. Try the dark chocolate with cacao nibs and Uyuni salt and the chocolate covered peanuts. If you really want to eat like the locals, head to Mercado Camacho for a traditional sandwich de palta (sin queso!) and api morada. A delicious hot drink made from purple corn, it is a bit reminiscent of glögg – or spiced holiday wine. We probably never would have tried it were it not for our new friend, Miguel. Located right in the middle of town, La Paz’s working class flocks here in the morning and afternoon where one can purchase a full meal for 10 Bs (not exactly vegan-friendly). Skip the meat and get an avocado sandwich in the comedor upstairs and get a massive fruit salad for dessert on your way out. You can also stock up on fresh produce and purchase pan de minero, or miner’s bread. Dog friendly: Kind of. There are clear no dogs allowed signs, but we brought Sora in with no problem. Morning and lunchtime might be a bit crowded, but when we went in the evening, there were no issues. Throughout the city, sometimes obvious, other times hidden among busy streets, La Paz is home to several bio stores that offer tofu (though sometimes you have to order ahead of time or know which day it is delivered), coconut oil, superfoods, nuts and seeds, grains and cereals and other vegan staples for snacks or for cooking healthy meals at home. Irupana supports Bolivian farmers cultivating organic foods and grains native to Bolivia. The company goal is to uphold and bolster the rich diversity of agricultural products and recover the food culture of the indigenous people in Bolivia. There are several store locations in the city and many stores that carry their products. On the go? Download this guide as a pdf so you can take it along while you’re out exploring La Paz! Disclaimer: Some meals were complimentary in exchange for being part of this guide. No other compensation was received. As always, all opinions are my own.